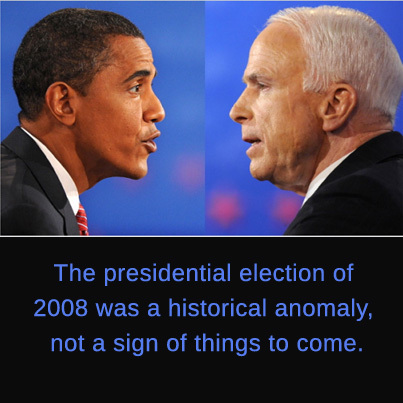 Was the presidential election of 2008 a harbinger of things to come, or a historical anomaly? The election of 2012 will answer that question once and for all. Barack Obama made all kinds of history when he won in 2008. Not only did he become the first African-American president, his running mate was the first Catholic to win as vice president; Obama was the first big-city politician to win in generations; he was the most liberal presidential candidate in history; and he was the first president with Hussein as his middle name. Obama had serious wind in his sails. His predecessor was one of the most unpopular presidents in history. The Iraq war had put the voters in a very bad mood. The Republican brand was shot after the Jack Abramoff scandal. The McCain campaign lacked focus and energy, and the candidate himself was upstaged by a new, untested and ultimately disastrous vice presidential candidate. And just as the Republicans started to get some momentum, a financial crisis shook the confidence of most voters. Obama offered a complete change in direction. He promised to get us out of Iraq. He inspired young people to vote in unprecedented numbers. He was a fundraising machine, raising twice the amount of his Republican rival. He also had the media on his side. Studies after the election showed that he got three times the positive press McCain — previously a media darling — received. Obama received more votes than any other candidate in history as a result, and he beat McCain by 10 million votes. Nine states flipped from the Republican column to the Democratic Party. But cracks began to appear in the Democratic coalition almost immediately. Obama received relatively few votes from white working-class voters. Older voters thought he offered too much change. And just barely won male voters, 49 percent to 48. In 2010, the Obama coalition failed to remobilize and the midterm elections were a disaster for the Democrats. Republicans captured the most House seats in a midterm since the end of the Great Depression. They just barely missed retaking the Senate, and at the state legislative level, Democrats got wiped out in 628 seats, the most in history. White voters, male voters and older voters led the charge against the president, and even married female voters turned sharply against him. Minority voters didn’t turn out in the numbers they had in 2008, and young voters by and large played with their Xboxes rather than turn out to vote. The president has ditched hope and change and replaced it with slash and burn this go-around. The Obama has been pretty successful at keeping the pressure on Mitt Romney, putting him on the defensive on his tax returns, tax policy and his vice presidential nominee. But the question remains: Will this effort by the president to turn the election into a choice help him to avoid it being a referendum? And more importantly, once the helping wind has died, does that leave the Obama campaign dead in the water? Indeed, the Obama campaign is facing serious headwinds in this campaign. The unemployment rate is terrible and the economy is not getting any better. The president’s approval ratings are in the danger zone. A historically perilous right-track/wrong-track calculus continues to bedevil the White House. There is a marked enthusiasm gap with young voters and with Hispanics. The fundamentals for the president’s reelection are weak and getting weaker. Much has been said about the polls and how Obama seems to be enjoying a post-convention bounce. At this stage in the game, Jimmy Carter was up 4 points; after the 1988 convention, Michael Dukakis was up 17. Don’t be fooled by the polls. The president’s reelection prospects are in serious trouble. And that means that 2008 was a historical anomaly, not a sign of things to come.